This fantastic outdoor cinema returns to Brighton beach at the weekend with ‘Footy and Films Aplenty’, showing from 10th June until 10th July. It’s the third time we have provided marquees for this month-long annual event, and this year is going to be the biggest yet! A varied choice of films are scheduled such as ‘Hairspray’ and ‘Jaws’, plus many of the Euro 2016 football matches will be screened live; sponsors include Ibis Hotels and The Argus. 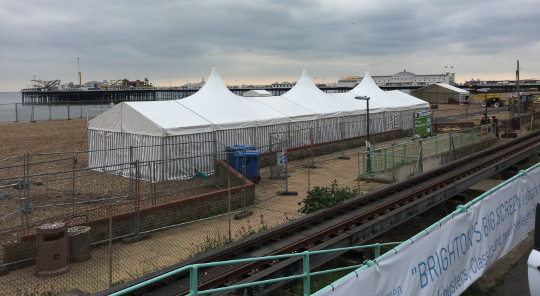 Our team were pleased with the clement weather last weekend for setting up the marquees – one that is to be the VIP Tent – sponsored by Ibis – and the other a bar tent for all attendees, located just to the east of The Brighton Pier. Both of the tents hired from ABC Marquees are 6m x 30m with a characteristic stripey exterior and peak roof, wooden floor and carpet, and transparent wall down one side that will open up to show the outdoor screen – and let in the sunshine, if we’re lucky! The VIP Tent will be scattered with beds for your outrageously comfortable viewing pleasure, available with the ‘Ibis hotels SweetBed VIP Experience’. Other film tickets are available (General, Premium or VIP) from just £3 whereas the football matches are free, beginning with the Euros opening ceremony this Saturday.